Is there any training involved? Yes - but it’s purposefully designed to be short, simple and easy to remember. There’s nothing complicated about it – the main safety points being the body positions you’ll need to adopt when leaving the aircraft, whilst in free fall, and the landing. Your Tandem Skydiving Instructor will do everything else for you. And thirdly, to act as the device that deploys the main parachute when your Tandem Skydiving Instructor pulls the rip-cord at the correct parachute opening height. To assist your Tandem Skydiving Instructor throughout the whole skydive process it’s important you adopt the correct body positions. The first position is as you leave the aircraft. This position is head back, chest forward, hands gripping your harness with your elbows down the side of your body, legs together, knees bent (as though you’re trying to kick yourself in the backside with your heels) and hips forward. Adopting this position and keeping still will assist your Tandem Skydiving Instructor in being to deploy the drogue parachute. Once the drogue parachute has been deployed your Tandem Skydiving Instructor will next tap you on the shoulders. This is your signal that if you want to, you can get your arms out and go into the skydiving position. If at any point however you get another tap on the shoulders it’s your Tandem Skydiving Instructor telling you to get your arms back in. As you approach the parachute opening height your Tandem Skydiving Instructor will pull the rip-cord to deploy the parachute for you - which will normally take a few seconds to open. With your parachute fully open and flying safely above your head you’ll have time to enjoy the views as you slowly descend towards the ground. At about 50 feet above the ground your Tandem Skydiving Instructor will ask you to adopt the position needed for landing - which is to have your feet out in front of you and your toes pointing upwards so you can land heels first. Your Tandem Skydiving Instructor will then land the parachute for you. As mentioned in the opening paragraph above, the training is purposefully designed to be short, simple and easy to remember. There’s nothing complicated about it – you just need to remember the body positions you’ll need to adopt when leaving the aircraft, whilst in free fall, and the landing. Your Tandem Skydiving Instructor will do everything else for you. What happens if the weather prevents my jump from taking place? Are there any age, weight or health restrictions? Do you jump with one or two parachutes? What height does the parachute open? 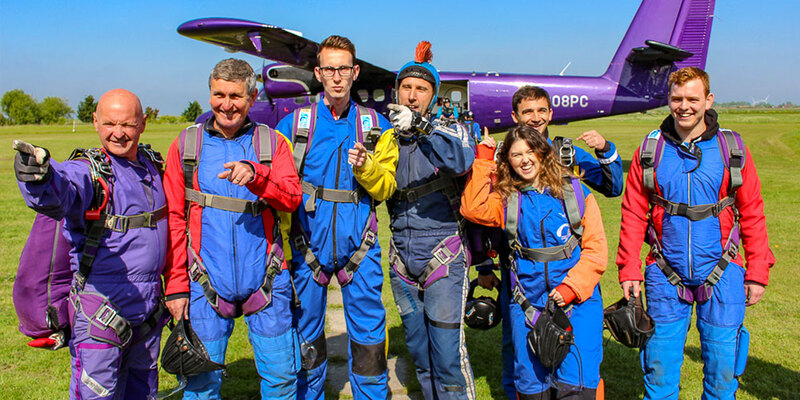 Skydive with our passionate parachute team & have an experience you'll never forget! Do something amazing and raise money for a good cause by making a charity tandem skydive. Tandem Skydiving has become by far the most popular and safest type of jump available to first timers.